1. It is very shouty in terms of looks, performance and driving manners. We specified our car in ‘polished metal’ (a shiny gunmetal grey) at a cost of £525 in an ultimately vain attempt to fly lower on the radar than the bright reds and blues in Honda’s sporty colour palette. Nevertheless, traffic light drag racers and motorway tailgaters loved getting up close to the Civic Type R, figuring that the huge rear spoiler, dramatic diffuser and flared wheel arches meant I was game for a laugh with them. 2. This new, FK2 model has a radically different character from that of the previous, FN2 Civic Type R.
The switch to a turbocharged engine has added impressive low-end performance and the 306bhp power output isn’t too far off that of the Civic Type R BTCC car, supporting Honda’s marketing claim that this is a ‘race car for the road’. I jumped back into an FN2 for the Goodwood Festival of Speed weekend and although the old car’s naturally aspirated charm bears up well, the FK2 eats it for breakfast in almost every tangible way. It rides better, stops more effectively, has plentiful grip and is more involving to drive hard. Apart from the noise, that is. The force-fed engine sounds gruffer and less tuneful than the older car’s i-VTEC. To my ears, the old one also generates less of a drone at steady motorway speeds. Allied with the road noise generated by the FK2’s wide, grippy tyres, long journeys in our car could be a little wearing. 3. The ride is acceptable in the car’s standard driving mode. Mindful of a hot hatch’s raison d’être, I expected a teethjuddering journey up and down the M3 each day, but the ride wasn’t anywhere near as harsh as I feared. It was taut, yes, and vigilance for potholes was still advisable, but I found I could live with it. This wasn’t everyone’s experience. Having waited patiently to borrow the Civic for a long weekend, colleague Hemal Mistry handed the key back after just one day because he didn’t get on with the car, citing discomfort as the reason. The high-sided sports seats were problematic for a few, er, larger-boned colleagues, too. Mind you, I’m not exactly snake-hipped and I found them pretty comfortable. I had no problem with the driving position or view out, either. 4. 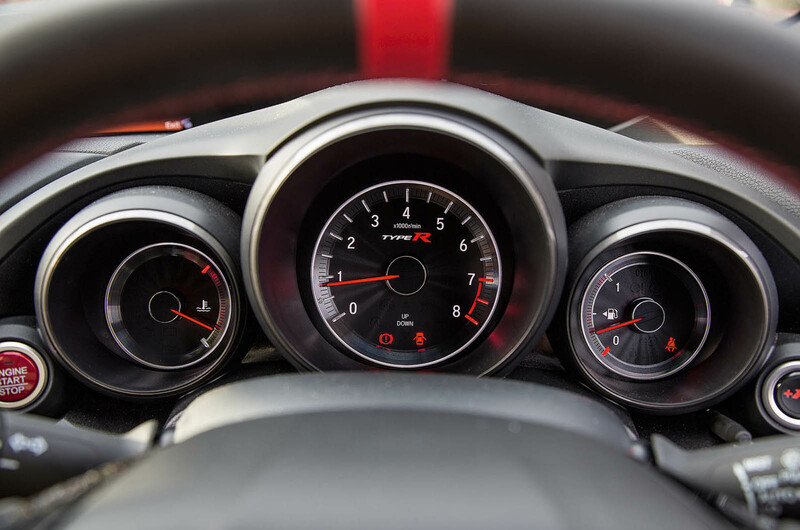 The Civic Type R is absolutely ferocious on track, and this is where the +R mode comes into its own. 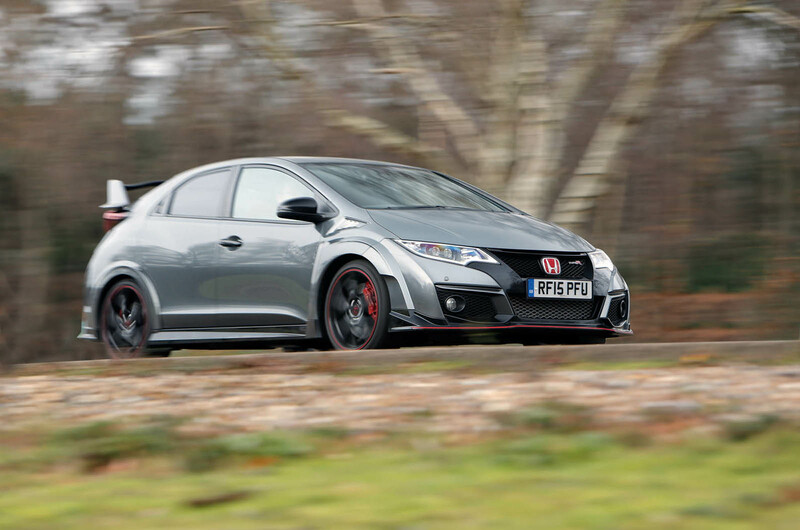 Picture editor Ben Summerell-Youde participated in a Civic Type R Owners Club track day and loved every minute of it. He came back raving about the levels of grip that enabled him to push harder as he gained more confidence. Ben’s day of hoonery did, however, destroy the car’s first set of tyres, and Honda’s post-track day checks led to the replacement of the front brakes and other components totalling more than £1500, which contributed to the higherthan-usual running costs. 5. The +R button, which turns the engine responsiveness, steering and adaptive damping up to 11, is pointless, on British roads, at least. I found it far too harsh to be enjoyable. 6. The dashboard layout is confusing. I found the scattering of information across several dials and screens distracting. For example, when the tyre pressure monitor alarm went off, the warning was displayed in three places on the dashboard. You might say better safe than sorry, or you might wonder what you’re looking at. Honda’s infotainment system is ripe for an overhaul and could be more intuitive. Hooking up my smartphone to the system was simple, but I could never remember how to access my contacts, a function that appeared to be buried in a sub-menu for no sensible reason. We had no major issues with build quality. The only problem was the sliding cover on the cupholder in the centre console jamming shut because it fouled on the removable divider under it. 7. I will miss it terribly. My time with the Civic Type R bore out the conclusion our road test team came to last August. “Living with it involves sacrifices that not all will be willing to make,” they said. Somewhat unexpectedly, I found myself willing to make those sacrifices because it was so much fun. In my opening report on the car, I wondered if I might feel too old for it, in particular that in-yer-face styling and my concerns over comfort, but I soon received reassuring emails from owners of a similar vintage who initially thought along the same lines but, like me, were convinced otherwise. There are more rounded hot hatches on the market, and ones that offer more technology for a broadly similar price, but few possess the cultish charm that Honda has cultivated over generations of Type Rs. This one may not be subtle, but it sure is a lot of fun. Better than the previous gen? Rather have two or three year old M3! Is there such a thing as dealer trade-in prices now? Well done autocar for a detailed breakdown of running costs. Can't remember seeing anyone attempt that before. The only thing I would add is the dealer price of the car and the trade value. There certainly used to be a difference but in my recent experience, that difference is now neligible. Your dealer value - is that figure from a book or did a dealer actually offer you £24777? I'm pretty sure dealers now look at the 'Webuyanycar' price and match it. My experience with Honda? Well I bought a new Honda in October last year and all local dealers I spoke to wouldn't offer any more than trade price for my mint part-ex. So I simply off-loaded it to an auction site for that trade price and used 'drivethedeal' to purchase my Honda from farther afield. Je have a Honda civic Type S 1.4. Good handling, but slightly gutless. PS it a Honda 1.4 Jazz engine, with a Go faster badge. @PC: M3 is more expensive to run. I'd look for Golf R.